The game is basically a miniatures game, but based on H.P. Lovecraft's Cthulhu Mythos. their lair. Of course, to do this, they must do battle with the other families, attempting to slaughter them before they can find the treasured book. Yep ... it's mass carnage. Move, invoke special powers and battle. That's about it. Thankfully, the board is small, so you encounter your opponents by the second turn and from then on, it is a constant series of battles and deaths. That means dice rolling ... LOTS of it. Since each character has a special power, quite a bit of time is spent reading the player charts to discover what each character's powers are and how to use them. 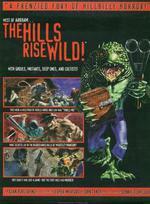 Regala The Hills Rise Wild! [USATO]!